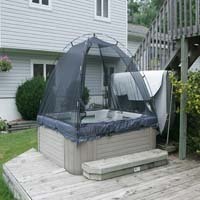 Enjoy your hot tub in complete screened-in comfort, day or night, with the Tub-A-Cabana hot tub enclosure system. 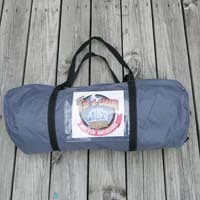 The Tub-A-Cabana is lightweight and durable and comes with an additional Full Privacy Cover. It’s easy to set up and attaches to your hot tub or spa in minutes - no hardware needed. Best of all, it’s Fully Guaranteed. If you are not satisfied for any reason, simply return the Tub-A-Cabana for a full refund. Don’t let another mosquito infested night ruin your fun! Tub-A-Cabana keeps the fun in and the elements out! 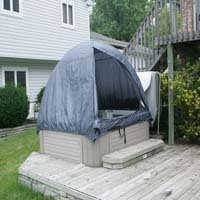 The Tub-A-Cabana hot tub enclosure and privacy screen is fully guaranteed.